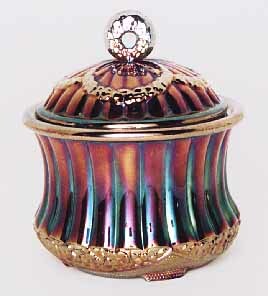 Last updated 1/16/2017 These lidded bonbons are the only shape known in the pattern according to Glen and Stephen Thistlewood in their book, A Century of Carnival Glass. This one, in blue, sold for $400 at a 2000 auction. Also reported in marigold. In 2016 a blue example sold for $375 and a marigold with a nick on top edge of the base brought $25.